The feathery leaves resemble fennel but its flavour is quite distinct. Dill has a mild and warm flavour. 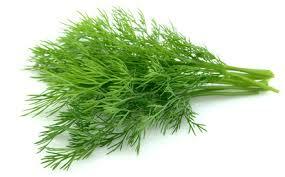 Dill is used in northern, central and Eastern Europe and loves to be paired with fish and summer vegetables. The aroma is faint, almost similar scent of aniseed. The herb, especially when fresh, has a much sweeter fragrance than its dried fruits. Dill leaves a wonderful aroma.